Beekeepers have long known that certain varieties of flowers attract bees more than other varieties. Bees pollinate more species of flowering plants than any other insect and can congregate in great numbers when their favorite flowers are in bloom. Situate a garden designed to attract bees well away from outdoor living space or avoid these areas when bees are present. Bees are the primary pollinators of most annual flowers, including sunflowers (Helianthus annuus), black-eyed Susan (Rudbeckia hirta) and pot marigold (Calendula officinalis). These annuals have broad flat centers that bees rest upon while drinking their nectar. Sunflowers are offered in a wide range of heights in all shades of warm colors, including yellows, golds, rusts and oranges. Some varieties produce a single large basal flower followed by a few much smaller blossoms that branch out from the main stem. Other sunflower varieties produce many branched plants with smaller flowers. This type will branch out even more if you pinch the growing tip when the plant has four sets of leaves. Black-eyed Susan are daisy-like flowers with dark brown centers and golden yellow petals. They grow about 30 inches high and are covered with blossoms from midsummer until killed by frost. Bees hover on the wide centers as soon as the petals unfold. Used historically as a folk medicine and seasoning, pot marigolds have multiple rows of tiny petals radiating out from the centers of their blossoms. They grow about 18 inches high in shades of yellow, gold and orange. The flowers of pot marigolds track the path of the sun by rotating their flower heads as the day progresses, just as sunflowers do. Attractive to bees because of its intense fragrance, lavender (Lavandula spp.) imparts an unusual floral note to honey made primarily from its nectar. Bees visit the plants several times as the flowers open up along upright spikes, which bloom from the bottom up. 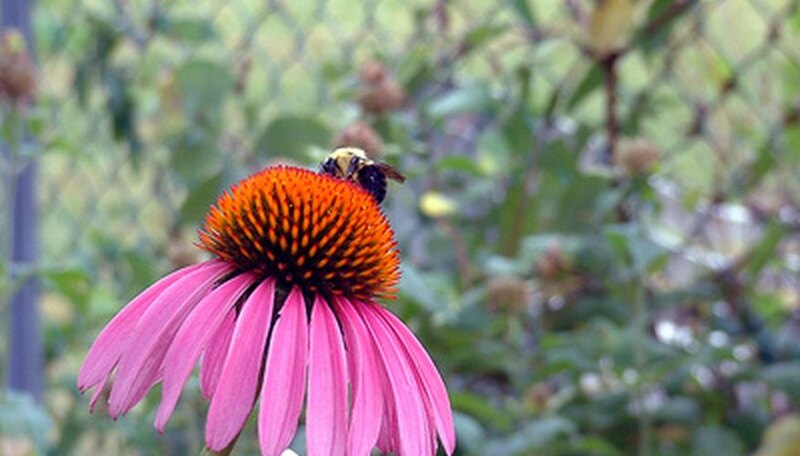 The native American wildflower purple coneflower (Echinacea purpurea) holds its nectar-filled center far above its petals and even bends them toward the ground to further entice bees. They rest on this raised center and easily reach the nectar on plants that can reach 3 feet high. A vigorous growing perennial, Russian sage (Perovskia atriplicifolia) is highly attractive to many species of bees. It grows 18 to 30 inches high with tiny lavender colored flowers covering branched spikes that are held above gray green lance-like leaves. Russian sage is often grown in far northern areas where winters are too cold to grow lavender. Vegetables in the Cucurbitaceae family, such as pumpkin, squash and zucchini are not self-pollinating and depend on bees to spread their pollen from flower to flower. The flange of the trumpet-shaped flowers is the perfect resting place for bees while they drink the nectar of these edible vegetable blossoms. Herbs such as Rosemary (Rosmarinus officinalis), thyme (Thymus spp. ), oregano (Origanum spp.) and mint (Mentha spp.) all produce tiny flowers in midsummer, rich with flavorful nectar that bees find irresistible. They hover just above them, easily reaching the honey-producing nectar inside.